Three trends emerged in the commercial real estate office market in the New Orleans area in 2013. Trend #1-Orleans Parish office space leased and sold faster than ever before, at an average 35 days on the market versus an average of 274 days the last 12 months. Trend #2-Orleans Parish office space for sale increased 54% as market imbalances pull demand from Jefferson Parish to Orleans Parish. Trend #3-Jefferson Parish office space for lease fell 41% this last month as space on the market an average of 349 days finally leased at a 13% discount. The available supply of office space for lease in Orleans Parish is 2.7 million square feet, with 1.8 million square feet for lease and 922,000 square feet for sale. There are 366 active properties with an average asking lease rate of $15.90 per square foot and actual lease rate average of $12.90 per square foot and average sale price of $65 per square foot. The amount of office space in Orleans Parish currently for lease is the same as the average the last 12 months at 1.8 million square feet, down from 1.7 million square feet on average the last 24 months. The amount for sale has increased 54% to 922,000 square feet, from an average 597,000 square feet the last 12 months and 662,000 square feet the last 24 months. The strength in demand is most visible in the days on the market, which averaged 35 days the last months, compared to 274 days the last 12 months and 296 days over the last 24 months. With 1.8 million square feet supply in leasing space about the same as the average the last 12 months, and leased prices shrinking almost 20%, the shortened days on the market tells us that there is price elasticity in the leasing market, meaning as prices drop, there is an increase in demand, assuming supply is constant. Some markets are not as elastic, such as in Kenner or New Orleans East, meaning that a reduction in price does not bring increased demand. These markets are more inelastic. There is currently 1.4 million square feet of available office space in Jefferson Parish, with 891,000 square feet for lease at an average asking price of $17.25 per square foot and actual lease rate of $15.07 per square foot, and 539,000 square feet for sale at an average asking price of $101 per square foot and actual sale price of $91 per square foot. The supply of office space for lease has plummeted 41% to 891,000 square feet from 1.5 million square feet on average the last 12 months. The supply of office space for sale has increased 26% to 538,000 square feet from 425,000 square feet on average the last 12 months. The trend toward more properties for sale is due to the strengthening of prices, which causes property values to rise and owners selling to take advantage of the increased prices, with the resulting increase in square footage of office space for sale. Another trend is a result of the 41% decline in leasing square footage available, causing lease asking prices of $17.25 per square foot, higher than the 12 month average of $17 per square foot and the $16.93 per square foot on average the last 24 months. Office leasing in Orleans Parish is pulling demand from Jefferson Parish, as a result of competitive pricing averaging actual lease rates of $12.90 per square foot, compared to $15.07 per square foot. 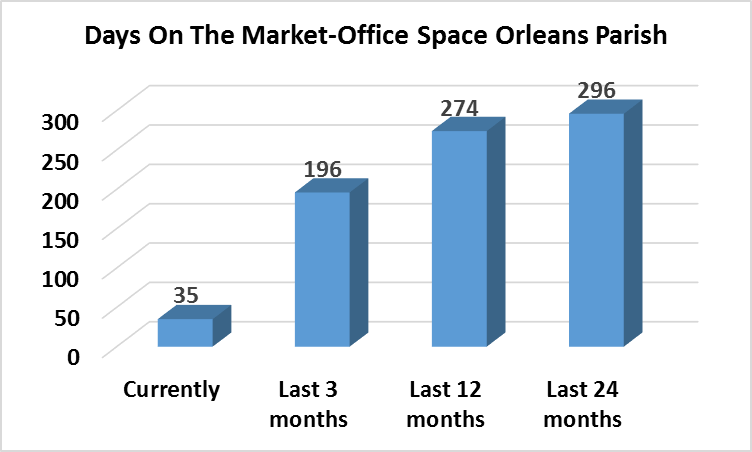 Demand is high in Orleans Parish for lease and sale of office space, as evidenced by the 90% drop in days on the market over the last 12 months.